“I would’ve taken a point before the game as this is a difficult place to come; Gillingham have been in good form and playing some good stuff lately, But we were well worth three points. We had the lion’s share of chances, we outshot them and in the first half we were devastating and deserved our two goals. However, you have to give credit to Gillingham. They got back into the game and I’ll never deny the facts – they’ve done well, with two good finishes, but they were sloppy from our point of view and I’m disappointed about that. “But let’s put things in perspective. We’re ninth in League 1 and people are thinking we should be getting three points here and three points there every week. I’m very happy with where we are in the league and it’s another point closer to our target. 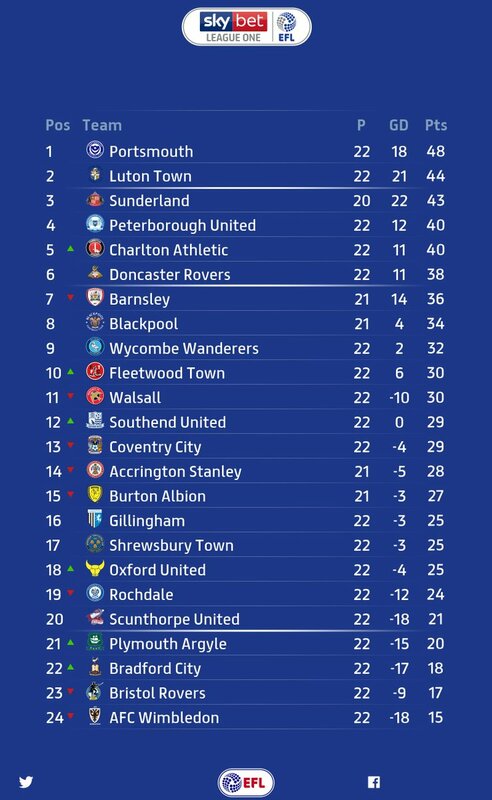 Wanderers remain 9th - 6 points from the play-off zone. Both strugglers, Plymouth and Bradford, won to close the gap to the relegation places to 12 points. Wimbledon remain rooted the foot of the table with another defeat. They visit Adams Park next Saturday (22nd December 2018) where Wanderers will be aiming to set a new Club Football League record of seven consecutive home wins.